"My son loves for me to take these to his Scout meetings. Very yummy." Preheat oven to 375 degrees F (190 degrees C). Lightly coat baking sheets with cooking spray. Stack tortillas and cut into 8 wedges, to make 48 wedges total. Arrange wedges in a single layer on prepared sheets and lightly spray with cooking spray. Bake in preheated oven until crisp and golden, about 10 minutes. Slide onto wire rack to cool. In a small saucepan over low heat, melt chocolate. In another small saucepan over low heat, melt caramels with water. Place a sheet of waxed paper under rack with tortillas. 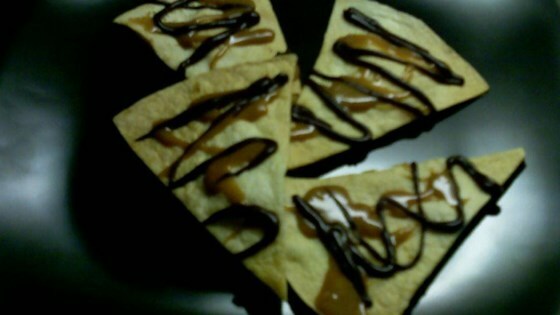 Working with about 12 at a time, drizzle chocolate and caramel over tortillas using a fork. Let stand on waxed paper to set. You may need to remelt between batches. When set, store in an airtight container between layers of waxed paper. See how to make an impressive but simple chocolate and peanut butter candy. Didn't think these would be tasty, but they are really good. And the kids really loved them. Thanks for the great recipe! Came out kind of dry.